How do I become a member of the Branson Tourism Center Affiliate Program? It’s very easy. Simply fill out the Affiliate Application here to get started. Once your application has been processed, you will receive an e-mail with instructions on how to log into your Affiliate Account on Book.Branson.com and begin earning commissions. How can I tell if my web site is eligible to participate in the Branson Tourism Center Affiliate Program? After you submit the completed Affiliate Application, we will evaluate the suitability of your site for the Program. We will make this evaluation based on our own discretion. For example, an unsuitable site would be one that contains defamatory, harassing, harmful, insulting, obscene, offensive or unlawful content; content that is contrary to our purpose and intent; and links to sites that contain such content. How will I know if my Affiliate Application has been accepted? We will notify you by e-mail. If we reject your Affiliate Application, we welcome you to reapply for participation in the Program at any time. Is it free to be a member of the Branson Tourism Center Affiliate Program? Yes. There is no cost to you to become an Affiliate. In fact, as an Affiliate, we will pay you commissions on any purchases made on Book.Branson.com that are referred by the affiliate link on your web site. Can I use more than one site in the Branson Tourism Center Affiliate Program? Yes. If you have more than one site that you would like to include in the Program, simply include each web site in your Affiliate Application. We will evaluate each identified site for suitability in the Program. Once you are accepted into the Program, you can put affiliate links to Book.Branson.com on any of the web sites that we evaluated and approved. 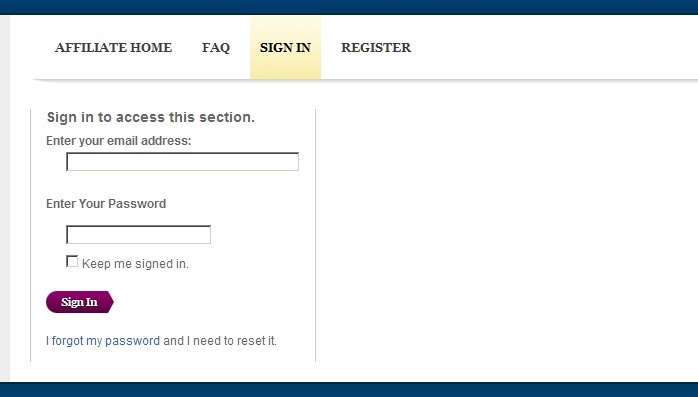 What if I want to add a new web site after I sign up? You can. Just visit the "My Account" section when signed in to your Affiliate Control Panel to add additional web sites to your account. Can I put other affiliate links on my web site? Can I be an Affiliate if my company is based outside of the United States? Yes. However, customers that purchase from Book.Branson.com must pay in U.S. dollars, and all commission checks that you receive will be in U.S. dollars. Yes. We require a W-9 from all Affiliates because we are required to report the commissions you earn. How do I add Book.Branson.com links to my web site? Once your Affiliate Application has been accepted, you will be given access to log into the Affiliate Control Panel on Book.Branson.com. Once logged in, navigate to the “Banners” page to select from a variety of graphics and links. 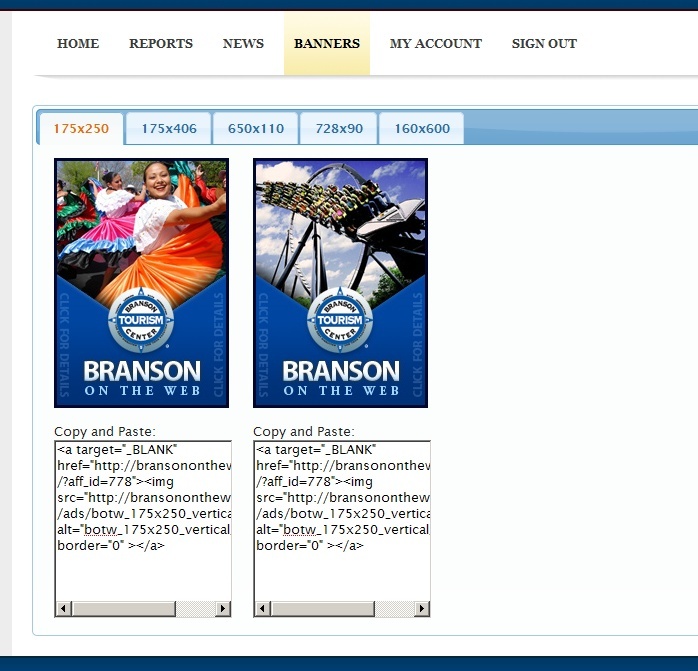 You can then copy and paste the HTML code to embed into your web site to display the link to Book.Branson.com. Any users that get to Book.Branson.com through these links will be tracked, and you’ll earn commissions on anything that they purchase on Book.Branson.com. Can I choose/specify which page on Book.Branson.com my banners will link to? Yes. While logged in to your affiliate account, simply browse to any page on Book.Branson.com. At the bottom of each page, you will find a section titled "Link to this page." Copy the text provided to create a plain text link to that specific page, or click the "Select a Banner" button to choose a banner ad that links to that specific page. Click here to watch our online tutorial on how to customize an Affiliate banner. Where do I need to put the links to Book.Branson.com on my web site? You can put the Book.Branson.com links on any part of your web site that you think will drive the most traffic to Book.Branson.com. Remember, the more purchases you refer to Book.Branson.com, the more commissions you’ll earn! How do I maintain the HTML code? Make sure that you choose a banner graphic while signed into the Affiliate Control Panel, and make sure that you copy and paste the exact code provided in your Control Panel into the HTML code of your web page. How often do I need to update the links that you provide to Book.Branson.com? You should log in to the Affiliate Control Panel at least once a month to check for any updates to the HTML code and graphics provided to you to use as links to Book.Branson.com. How do I make money as an Affiliate? You will be paid a commission of 5% of net sales of any item sold to customers who arrive at the Book.Branson.com through an approved link on your site. “Net sales” is the gross revenue that we receive after a purchase is processed and confirmed through our processing department, minus any amounts that we collect for sales taxes, duties, handling, and similar charges, and excluding any purchases that are subsequently refunded, rebated or cancelled by the customer. Once a customer comes to Book.Branson.com through your affiliate link, and they create an account and make a purchase at Book.Branson.com, your affiliate I.D. stays with them! So, if they come back to Book.Branson.com at a later date, either through your affiliate link or on their own (so long as they don’t come from a different affiliate link), and make another purchase, you get the commission! On which items will I earn a commission? You will earn 5% of net sales for any item available for sale on Book.Branson.com, including all tickets to any show or attraction, and any lodging, package, meal voucher, or other item sold on Book.Branson.com to customers that were originally referred by the affiliate link on your website. How does Book.Branson.com track purchases that I refer from my web site? The links (HTML code and graphics) that we provide to you through the Affiliate Control Panel on Book.Branson.com will contain certain parameters that uniquely define your web site. When a user clicks one of these links to get to Book.Branson.com, we will be able to determine that they came from your web site through one of these links. It is important that you ensure that the formats of the links provided to you are maintained exactly as provided in order to ensure that any commissions earned by you are accurately tracked and recorded. Can I see my sales activity and commissions? Yes. You can review your sales reports, statistics and other information by accessing the Affiliate Control Pane at Book.Branson.com. After you are accepted into the Program, we will we will grant you access to the Affiliate Control Panel, where you will be able to receive sales statistics, reports, and other information, as well as the HTML code and graphics that will enable you to link to our site. This online service is provided to all members free of charge and is available 24 hours a day, 7 days a week. 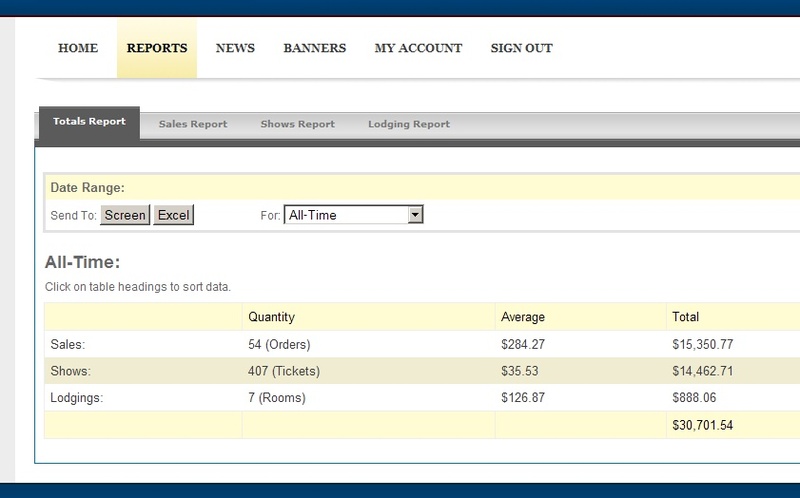 Simply go to Book.Branson.com/affiliates and click “Sign In.” Once logged in, navigate to the “Reports” tab to view and export detailed sales and commissions reports. Do I have to be able to process transactions on my web site? No. When you refer a customer to Book.Branson.com from your web site through the affiliate program, the transaction will be processed on our web site. We will handle the customer service for all customers that you refer to Book.Branson.com through the affiliate program. All you have to do is put links on your site to get them to Book.Branson.com, and we’ll take care of the rest. If I own/represent a show, attraction, or lodging property and I'm signed up as an Affiliate, how do I get paid full price when visitors from my Affiliate link book my own property on Book.Branson.com? If you own or represent a show, attraction, or lodging property and you have an FIT agreement with Branson Tourism Center, one of the benefits of being a member of the Book.Branson.com Affiliate Program is that you can earn full price on sales of your own property. As an illustration, let's assume that you are The ABC Variety Show. You sell tickets to customers for $29.00 (taxes included). You have an FIT agreement with Branson Tourism Center who also sells your tickets to customers for $29.00 (remember, Branson Tourism Center never charges a mark-up or service fee). You have an FIT rate with Branson Tourism Center of $19.00 (taxes included). So, you'll make the same $29 revenue as selling through your own box office. Plus, you'll earn 5% of everything else the customer purchases – Shows, Attractions, and Lodging! All in all, you'll earn more from your customers with Book.Branson.com! And remember, if that customer ever comes back to Book.Branson.com, even if they come directly and not through your affiliate link, you'll earn the same commission on all of their subsequent purchases too! So, how does this compare to selling your tickets without Book.Branson.com? With Book.Branson.com's FIT Affiliate Program, you can only make the same or MORE than your own box office! It is full-service, customized on-line booking with NO fees that pays you a commission on the rest of your customer's order!